Despite the triple-digit temperatures here in Southern California, autumn has arrived and pumpkin fever is in full effect. Apparently there is a shortage of the gourd this year, but you would never know it walking into your local Trader Joe’s. You can’t go more than three feet in an aisle before coming across some pumpkin-enhanced product: pumpkin bagels with pumpkin cream cheese, pumpkin kringle, pumpkin butter, and even pumpkin coffee. The pumpkin has evolved far beyond its modest pie-filling beginnings. Now, while I’m a huge fan of all things pumpkin, I understand that for many pumpkin fatigue will set in quickly (if it hasn’t already). Before that happens, though, I want to share one of my favorite fall recipes: Pumpkin Madeleines. I love madeleines, but as Dominique Ansel explained so perfectly, madeleines have a short and fleeting life – they are best right out of the oven, and if you wait too long, their light, airy texture goes away. In fact, at his New York bakery the madeleines are made to order and customers are instructed to eat them on the spot. Of the many madeleine recipes I have tried, Dominique’s is the best; here is my version of it, colored with that most popular of autumnal flavors. Melt the butter, brown sugar, and honey in a small sauce pan over low heat. Keep the mixture warm over very low heat. When the wet ingredients are completely incorporated and the batter smooth, add the warm butter mixture. Mix the warm butter into the batter with a rubber spatula until complete incorporated. Press the plastic wrap pressed directly onto the surface of the batter, to prevent a skin from forming. Add another plastic wrap on the top of the bowl. Refrigerate overnight. This step helps create the lovely signature hump. Spray non-stick butter spray in the Madeleine pan, buttering each of the molds evenly. Pipe the madeleine batter into the molds so that it fills each about three-quarters of the way to the top. 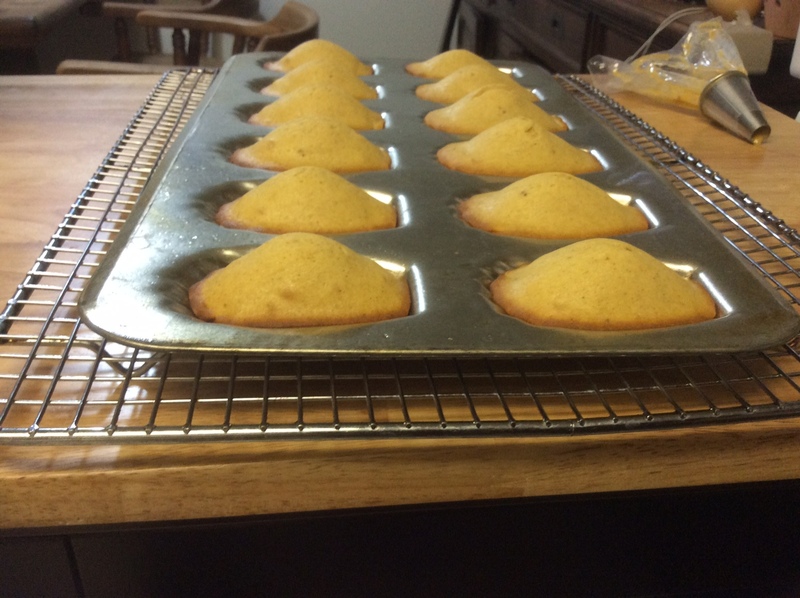 Bake the madeleines for about 5 minutes on the center rack. When you see the batter develop a hump in the center, rotate the pan 180 degrees. Bake for about 5 minutes more or until toothpick test comes clear. Unmold on to a wired rack. Quickly transfer to serving plate and sift with powdered sugar. Serve immediately with coffee or tea. 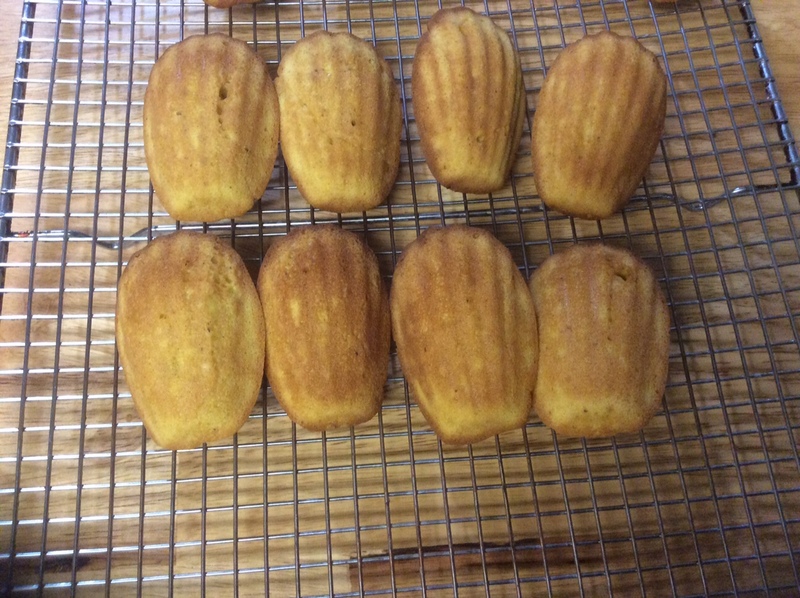 Madeleines are best when eaten within 10 minutes out of the oven. This entry was posted in Pastry and tagged Cookies, French Pastry, Madeleines on October 12, 2015 by food4so.